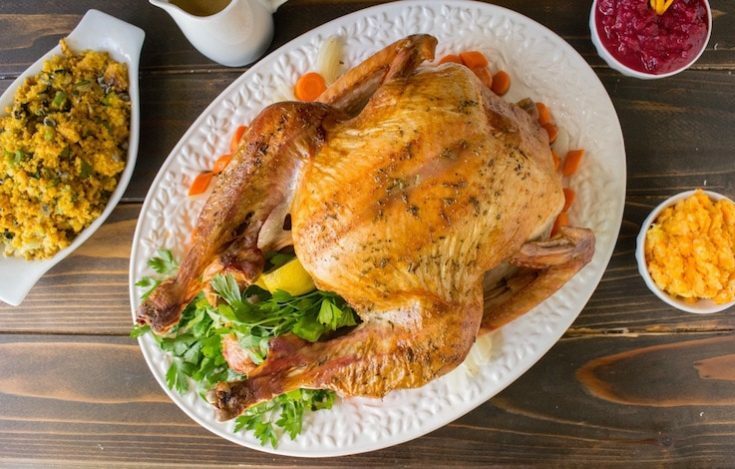 Perfect Roast Turkey is the star of the Thanksgiving table and I’m going to show you how to achieve the perfect roast turkey. The turkey is brined to retain as much moisture in the meat, then roasted to crispy, juicy perfection. We are in the midst of the holiday season and it’s time for everyones favorite bird. A roast chicken dinner is my favorite meal, so I make it a lot in the cooler weather . I have very specific steps I like to follow and I follow the same steps when I roast a turkey. It all starts the day before the roasting of the turkey (or chicken), I like to brine my turkeys and chickens. Brining helps add moisture to the meat as well as flavor the meat so the bird is tasty throughout. Turkey can be on the dry side and brining really prevents it drying out in the roasting process. Depending on how long I have to prepare the meal, I like to brine about 24 hours in advance. If brining is not for you, or you just don’t have time or the space, you can skip this step. Depending on the size of your turkey (or chicken), you will need a large receptacle. For my 13 pound turkey, I used an 18 quart plastic container available at any restaurant supply store and lots of room in the fridge. I like to tie the legs together with cooking twine. It’s also a good idea to get the wings tucked in. To do this, I cut a slit in the skin next to the wing and tuck in the wings under the skin (this can be seen in the picture above). This will prevent the ends of the wings getting overcooked or even burning. What the turkey sits on to roast is also very important, I like to place a roasting rack into a roasting pan. This serves 2 purposes, it allows the heat to distribute all around the turkey for more even cooking and I like to add vegetables and broth to the bottom of the pan so my gravy is made while the turkey cooks. You can read more about making easy, flavorful gravy in my rosemary roasted chicken with delicious gravy recipe. 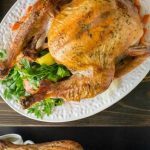 Based on the FDA recommended oven temperature of 325°F/160°C, a fresh turkey should be roasted for 15 minutes per pound. This is a 13 pound turkey so it should be roasted for 3 hours and 25 minutes. Not all ovens are calibrated correctly so it is important to use a meat thermometer for accurate doneness, see below. Making sure your turkey is cooked is the most important part of the job. 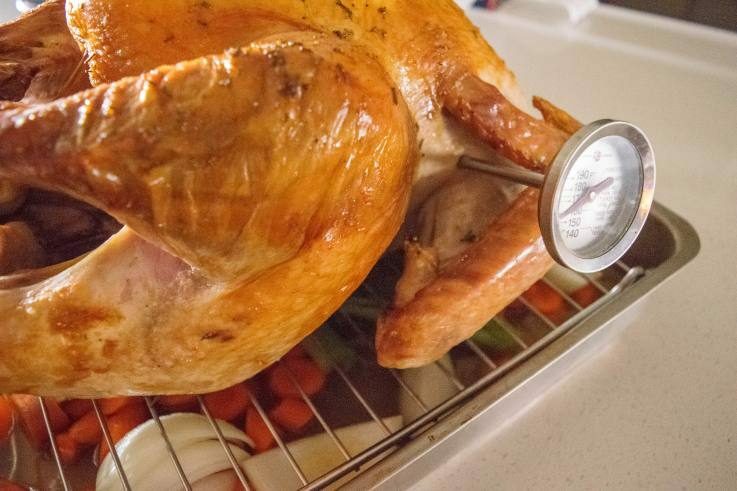 Inserting a meat thermometer into the turkey between the leg and the wing is the most accurate way to tell when it’s cooked. The temperature should read 165°F/74°C. The turkey will continue to cook after it is removed from the oven, so don’t let it read higher than that. Once you remove the turkey from the oven, cover lightly with foil and allow to rest at least 20 minutes before slicing or all the juices will run out. If you’ve ever cut into any roast meat as soon as it comes out of the oven and you see the juices running all over the cutting board, those are the juices that keep the meat moist and you just lost them. Use this resting time to prepare your side dishes. Happy turkey day! 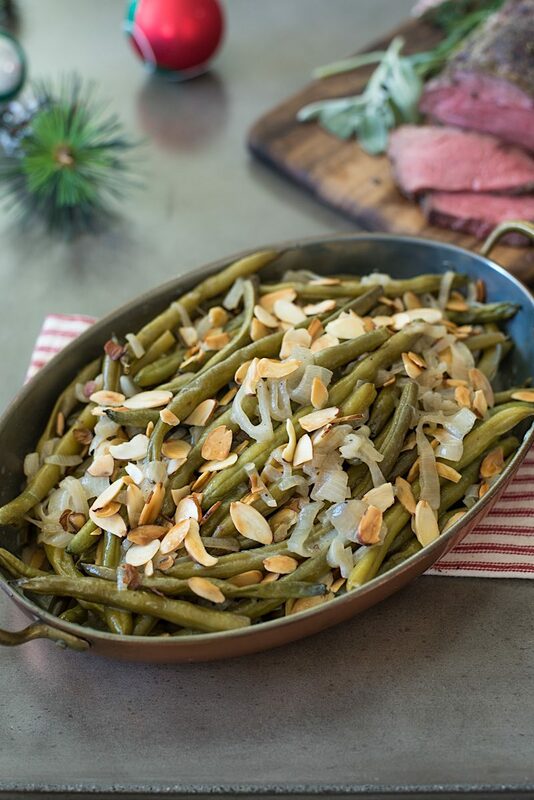 Make sure you check out the fabulous turkey side dishes below. If you’ve tried this Perfect Roast Turkey or any other recipe on the blog then don’t forget to rate the recipe and let me know how you got on in the comments below. I love to hear from my readers! You can also FOLLOW ME on FACEBOOK, TWITTER, INSTAGRAM and PINTEREST to see daily recipe updates. The turkey is brined to retain as much moisture in the meat, then roasted to crispy, juicy perfection. Fill a large stockpot 1/2 full of water. Add the garlic, sugar, salt, peppercorns, bay leaves and herbs. Heat over high heat until it comes to a boil. Lower the heat and simmer for 5 minutes until the sugar and salt are dissolved. Leave the brine to cool completely. Fill to 3/4 full of ice water and submerge the turkey completely in the brine. Cover and refrigerate for 24 to 48 hours. Preheat oven to 325° F/166°C. Remove the turkey from the brine and dry. 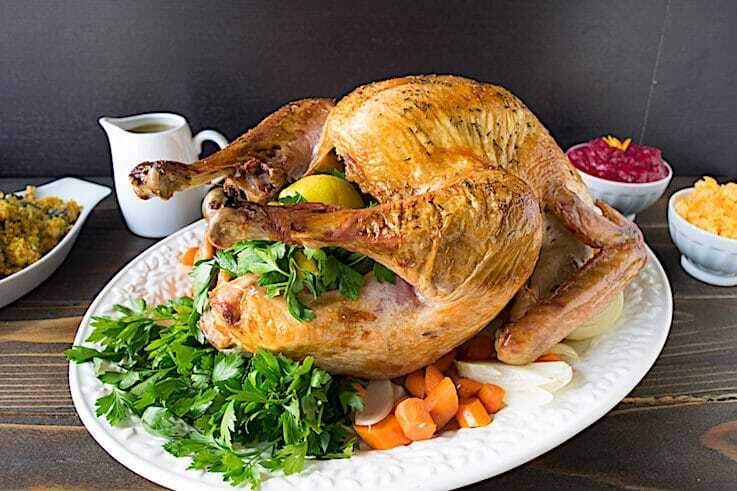 Place the turkey in a roasting pan and leave on counter for 1 hour before roasting, this will ensure even and faster cooking. Brush the skin of the turkey with the melted butter. Sprinkle with salt and pepper. You can also sprinkle with any freshly chopped herbs if you like. Roast the turkey for 3 hours and 25 minutes or until a thermometer inserted reaches 165°F/74°C. Remove the turkey from the oven and cover lightly with foil. Allow to rest for at least 30 minutes before slicing. Turkey is definitely the best part about Thanksgiving! Love your simple method, it makes cooking a turkey much less intimidating. I’ve never actually brined my turkey before or roast chicken for that matter, but will have to give it a try. I’ve never brined a turkey as I’ve read that store bought turkeys with the added sodium shouldn’t be brined. I cook mine in one of those roasting bags and they are never dry. No one in my family has even been allowed to suggest that they make the turkey after I started making it – there’s an outcry when that happens lol. I actually love cooking the bird, so that’s fine by me! Thanks for stopping by Stephanie. I think everyone should be wary of the type meat they’re buying and brining is not for everyone. The turkey used was from a local organic, free range farm, so I know how it was raised and treated prior to purchase. I’ve never tried brining before but I bet that’s the number one key to a better turkey. I do find that turkey can come out very dry. Better get myself one of those meat thermometres, too! Looks delicious, Janette! That is one gorgeous turkey! Believe it or not, I have never had to make a Thanksgiving turkey…we’ve always celebrated with my in laws and my father in law is an amazing cook. This is our first year without him, and now we are going away. I am pinning this though…at some point I will be cooking our own turkey! Thanks Michelle, let me know how it turns out. Lovely looking meal, can’t go wrong with a perfectly roasted turkey! Beautiful pictures and the turkey looks amazing! These are amazing pics! Thanksgiving cannot come fast enough. I love all the sides too. 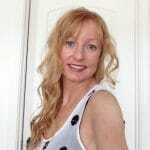 Hallo Janette, your roast turkey looks delicious, nice pic too! Great information that we’ll all be needing soon. I cook our family turkey every year. 🙂 Thanks! Thank you so much, I hope my tips help. Great post and photographs Janette! Janette, great read! I also brine my turkey’s the day before! Seems like the best way for me!!! 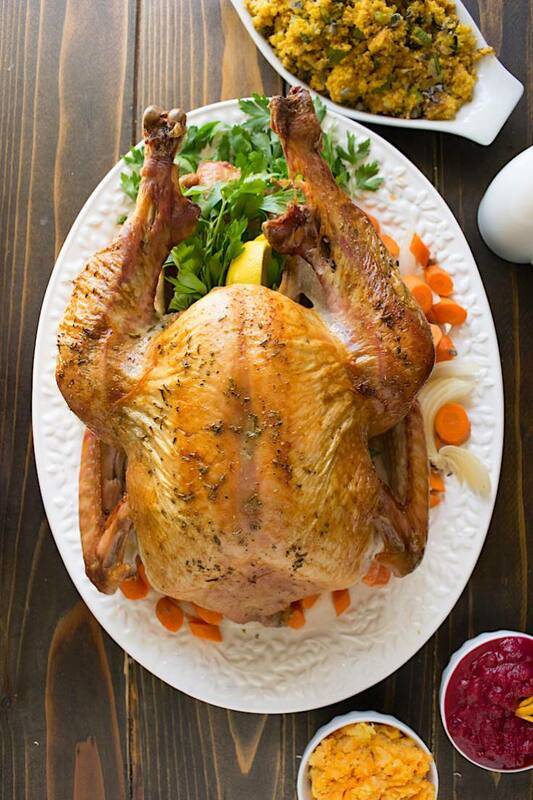 Your turkey looks perfect! Golden brown and moist. I’ll be making Thanksgiving dinner this year (only for 9.5 people). Thanks for sharing your recipe, I can always use some help. Gorgeous Janette! Beautiful photos and such a pretty bird! This turkey looks crispy and delicious! Honestly, I make roast chicken all the time, but never made a roast turkey! It is always someone else in the family, who is responsible for this. Feels like it is time to try it. I’ve heard that brining is essential for roasted turkeys. Thanks for the wonderful recipe and tips Janette! Thank you so much Mira.